This design stitched out perfectly! I would love to know the name of the font and if it is available to purchase. Fantastic came out really well I put it on a cushion and will be giving as a gift for a 50th birthday present. The silhouette of the King of Rock and Roll, will make a perfect gift for Elvis fans on t-shirts, sweatshirts, jackets and more! 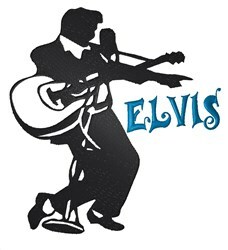 King Graphics is happy to present Elvis Presley machine embroidery design which has 15653 stitches and is [137.41 mm x 149.35 mm] large. If you would like to view more embroidery patterns please search on our embroidery designs page.